Signature of South Pittsburg recently had their second group of students graduate from C.N.A class. These 7 young ladies have done a wonderful job in class and are now teamed up with C.N.A’s on the floor that will help guide their journey along. 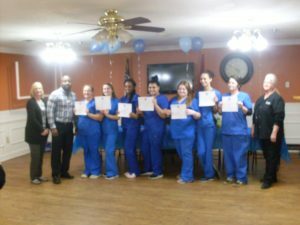 We are very proud of these ladies and we encourage them to continue on further in the nursing field. When each student was asked why they chose this path, it was heartwarming to know that each of them have a passion for helping and caring for others. Great job ladies and we wish you the best of luck.